If you have an e-commerce business then you know very well how complicated is e-commerce shipping. There are several obstacles that your products have to face in the journey from your warehouse to the customer’s doorstep. The potential mistakes involved in the delivery process can have a major setback on your business and brand reputation. However, with clear guidance from a reputed e-commerce shipping solution like ShipKaro, you and your team can easily navigate through these hurdles to ensure a smooth delivery for your orders. We have compiled here a list of a few common mistakes in e-commerce shipping that can cost you dearly. If you identify with any of the following points, then it is time to make changes and choose ShipKaro as your logistics partner for more efficient shipping. There are several courier services in India facilitating e-commerce shipping. Unless you are focussing on a regional customer base and have a dedicated in-house e-commerce shipping solution team, you will have to depend on these courier services for your shipping purposes. Never make the mistake of depending on the services of only one courier company for your entire shipping. While there are courier services that have a pan-India reach, most of them have a specialised service or region wherein they excel. So how about relying on the combined services of several courier services to make your shipping even more efficient. With ShipKaro, it is extremely easy and simple. ShipKaro is a logistics aggregator wherein you can easily compare prices and find the most affordable option for all your orders. You can also compare different delivery dates and find the fastest e-commerce shipping solution for your shipment. Moreover, you can split a multi-product order and assign the most cost-effective or the fastest shipping partner for individual products. This way you can make sure that you can save money and time for every single product. Also, with ShipKaro’s integrated courier service with multiple shippers, you can get the maximum coverage for your website. You can reach every corner of the country and expand your customer base. In this cut-throat competition field of e-commerce, you have to ensure that the logistics service provider you depend on, has real-time tracking options for your orders. It is not only an efficient way to manage your logistics, but also a necessary option. It is also important to keep your customers in the loop regarding their orders. When you let the customer know where their orders are, they are more relaxed. This consequently increases the trust they have with your brand. With ShipKaro as your e-commerce shipping solution, you can stay updated about your orders in real-time. You can share this information with your customers and ensure that they are also updated about their products in transit. Technology-based logistics is no longer a luxury for your business, but a necessity. With ShipKaro’s advanced shipping software, you can automate the bulk of your logistics process and save time. You can automate your shipping label generation for each product. This way the process is not only easier but the minimal manual intervention also promotes error-free results. With ShipKaro as your e-commerce shipping solution, you can even process your bulk orders in a single go. Additionally, ShipKaro lets you automatically sync your orders from wherever you are selling and get them shipped in just a few clicks. This way all your shipping information is also automatically synced without having to rely on multiple platforms. It makes sure that you are connected to all channels and manages your omnichannel selling presence. Another major advantage of using ShipKaro logistics platform as your shipping solution is the scalability it offers. The ShipKaro shipping software as your e-commerce shipping solution is updated constantly, making sure that your business stays ahead in the market. Our system grows along with your business and offers you a wide range of features scalable for your business. The platform offers easy to use UI that can be easily handled to create efficient shipping. This is one common mistake many e-commerce retailers commit in India. With a logistics aggregator like ShipKaro, you can avail several shipping options like comparing prices and finding the fastest delivery option for each individual product. This ensures that you can choose the most cost-effective e-commerce shipping solution for your shipping every single time. What if your customer is more interested in faster delivery and is even ready to pay for extra shipping charges if you provide them with faster delivery? To find out your customer’s preferences, you need to give them the option to make choices regarding their product delivery. This can also include options like when and where they want their product to be delivered. The more options you provide your customer, the happier the customer is. As long as you are concentrating on creating a successful e-commerce business in India, you have to make sure that you are providing a cash-on-delivery option as a payment mode for your customers. Cash on delivery is one of the most commonly used payment methods in India, and you have to make sure that your e-commerce shipping solution supports your COD payments. ShipKaro logistics service provider offers end to end support for your COD cycle payments, giving you the opportunity to expand your customer base. Now no need to lose potential customers who wish to make payments through COD mode. These mistakes may seem like straightforward errors that you are very rare. However, the truth is that there are a lot of e-commerce retailers who still make these mistakes, which ultimately affects their delivery processes. At ShipKaro, we understand that running an e-commerce store successfully is extremely difficult. You may be juggling different operational tasks at the same time that it is highly possible that many things may go wrong. 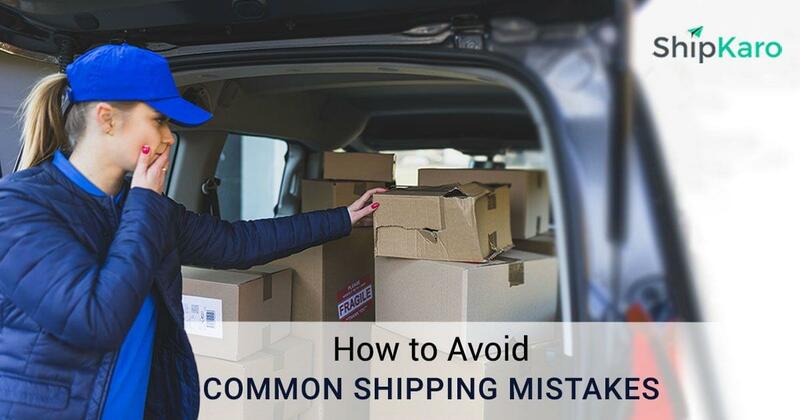 We hope that from the above list, you may get an idea on the most common mistakes made by online retailers in shipping and how you can avoid those with ShipKaro e-commerce shipping solution. If you have any other points to be added to the list, let us know in the comments below. To know more about creating an efficient shipping strategy for your e-commerce store, contact ShipKaro now. We are always happy to help.